Raymarine’s Element 9HV with 9” display ships with Navionics + maps for detailed U.S. and Canada Coastal and Lake Mapping. Includes HV100 Transom Mount transducer providing HyperVision, DownVision, SideVision, RealVision, and conventional CHIRP sonar for the best underwater imaging! If you’re looking for a durable, push button controlled GPS/Fishfinder with exceptional sounder performance, then The Raymarine Element 9 HV with the HV100 transducer is the unit you have been waiting on. 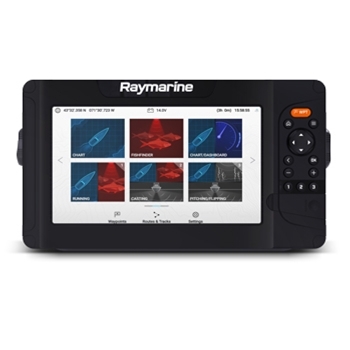 The super bright 9” sunlight viewable display provides you with crystal clear sonar imagery and charting views right at your reach. The Raymarine Element 9HV combo unit is a great fit for smaller inshore, nearshore, and inland style boats. The HV100 provides High resolution CHIRP sonar technology that works together with DownVision,HyperVision, SideVision, and RealVision 3D to bring you unsurpassed sonar functionality. Included with this Element 9HV is detailed Navionics+ mapping that covers US Coastal waters and US Inland Lakes. The Nav Plus charting from Navionics provide spot soundings, markers, buoys, contour lines, tide information and other data needed for navigation purposes. The Raymarine Element keeps you on target with simple keypad controls and an angler centered LightHouse Sport operating system, so you can keep your focus on fishing, not adjusting your GPS/Chartplotter. An oversized waypoint key puts you on your favorite spots, while the Element's industry-unique RealBathy personal depth-map generator even lets you make your own high-definition bathymetric maps on the fly. The quad-core processor is lightning quick and allows you to maneuver the menu options without delay. Included with your Element 9HV is the HV100 transom mount transducer that keeps you ahead of the game. The HV100 provides HyperVision, DownVision, SideVision, RealVision, and conventional CHIRP sonar for the most crisp, clear underwater imagery. HyperVision 3D sonar and CHIRP work simultaneously with higher frequencies to provide a new level of sonar technology to your boat. The 1.2 MHz HyperVision mode offers higher resolution imaging up to 100’ for better fish targeting and high-speed bottom tracking. Easily switch to a 350kHz CHIRP sonar for longer range and higher resolution imaging up to 600’ below the boat. RealVision 3D sonar offers a better depiction of vegetation, ledges, channel beds, and any contour changes that may affect the type of fishing you are doing. The Element 9HV has 8 GB of internal memory with room for 10,000 waypoints, 150 routes, and 15 tracks however this can be expanded by adding up to a 32GB sd card. With NMEA2000 connectivity, you’re able to easily integrate VHF’s, Deading sensors, Engine Data and more! 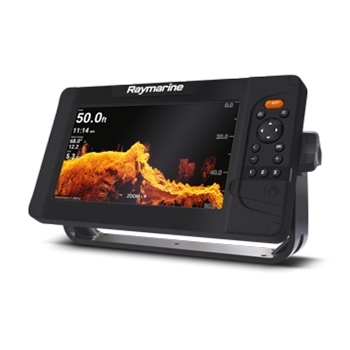 Raymarine’s Element GPS/Fishfinder provides a bright 7” display! Built with a Quad Core processor for quick and accurate on screen information, the 7HV ships with Navionics + maps and an HV100 transom mount transducer combining HyperVision, DownVision, SideVision, RealVision, and conventional CHIRP sonar for the best underwater images. Raymarine’s Element 12HV with 12” keyed display ships with Navionics + maps for detailed U.S. and Canada Coastal and Lake Mapping. Includes HV100 Transom Mount transducer providing HyperVision, DownVision, SideVision, RealVision, and conventional CHIRP sonar for the best underwater imaging! Raymarine’s Element 9HV ships with Navionics + maps for detailed U.S. and Canada Coastal and Lake Mapping. Built with a Quad Core processor for quick and accurate on screen information this 9” unit is capable of HyperVision, DownVision, SideVision, RealVision, and conventional CHIRP sonar when paired with a compatible Transducer. Transducer Sold Separately.